In the world of politics, money rules. Candidates need donations and a substantial amount of money to pay for advertising, equipment, office space, paraphernalia, staff and all the expenses of running for office. There are many ways to raise money … individual voters and organizations have a strong interest in seeing a candidate whom they support win an election. Although individual contributions are important, for most politicians, serious money-raising involves PACs and special interests. Special interests is a general term for any group that wishes to influence the course of elections or the actions of elected leaders once they are in office. A business lobby, for example, is a special interest, whether it's in the business of oil-drilling, sugarcane-raising or foreign trade with China. Others include the gun lobby or groups opposed to gun-control laws, the American Medical Association (AMA) and the American Association of Retired Persons or AARP. Labor unions represent the interests of union members; environmental groups also represent a type of special interest. The term special interests does not have the same specific legal significance as political action committee. When a group organizes to support candidates or political causes, the group may form a political action committee or PAC. Businesses, charities, labor groups, environmental advocates, community organizations and any other group can lawfully form a PAC. 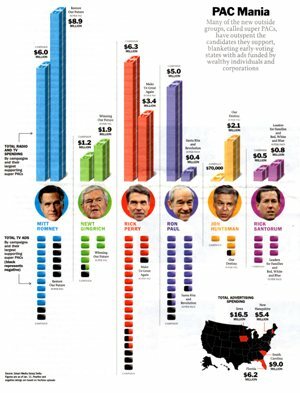 In each election, a PAC is allowed to spend $5,000 supporting an individual candidate. It can also donate $15,000 a year to the national political committees (the Republican National Committee or the Democratic National Committee, for example) and $5,000 to another PAC. When a PAC donates money, the candidate that benefits will naturally be more inclined to serve that group's interests. If the candidate wins, this financial support may continue into his/her term of office and play a role in passing or defeating important legislation. The resulting conflicts of interest – among constituents, political leaders and donors – have become commonplace. You are the manager of a PAC. In the upcoming election, State Representative Alpha is running for re-election against Challenger Beta. As the manager of the PAC it is your job to decide to whose campaign to contribute the PAC's money. Representative Alpha has held office for several terms, easily winning re-election two years ago. He has emerged as a powerful member of the legislature, chairing a major committee during the last session. In the past, Representative Alpha has been a lukewarm friend (at best!) in the legislature, supporting your interest group's policy positions only about half the time. Challenger Beta, meanwhile, has promised that she will support your group's cause much more faithfully than the incumbent if she wins the election. As the PAC manager, how would you answer the following questions? Write a summary of your answers to the 6 points below. Your summary should be thorough, specific, include relevant concepts from the course material and be free of spelling and grammar errors. What are the pros and cons of giving your financial support to Representative Alpha in the upcoming election? What are the pros and cons of giving your financial support to the challenger, Ms. Beta, in the upcoming election? Assuming that your PAC behaves in a fashion similar to other PACs, to whom will your PAC contribute the most money in the upcoming election campaign: State Representative Alpha or Challenger Beta? Send your summary addressing the 6 points given above in the body of a new email to dramyglenn@gmail.com.